From the Annual Wrap Up: Who’s Who in the Transition? You open up your mail. The first letter says your health insurance premium has been raised by 30%. The phone rings – it’s your father. His pension benefits have been cut by 50%. You parents are going to sell their house. They want to know if they can move in with you while they figure out what to do. Your company is downsizing and is offering you a buyout option, so maybe they can kick in with expenses and help around the house. Your neighbor stops by. There is a town hall meeting tomorrow night to discuss a plan to raise property taxes by 25% to meet increased municipal obligations and prevent a bond default. You monthly grocery and utilities bill are up 5% so far this year. Government statistics insist that inflation is running at less than 2%. Welcome to the pressure cooker as the slow burn accelerates. This is the end game in Global 2.0 – and with it a new wave of thousands of legal and financial “controlled demolitions.” The change in administrations in Washington is only a piece of this transition. The financial coup d’etat has used the debt growth model among other mechanisms to shift trillions out of existing government accounts and institutions. The debt growth model is fundamentally over and the liabilities are coming due. Washington is not offering bailouts. Now that perhaps $50 trillion has disappeared – much of it from government accounts – the lackeys who represent the thieves are calling for a balanced budget amendment. They get the assets. We get the liabilities. How’s that for fiscal responsibility? Americans are increasingly asking questions about “how the money works.” If DOD has undocumentable adjustments of $9 trillion last year and we used taxpayers money to give banks both foreign and domestic $27 trillion, why can’t we bailout municipalities and pension funds? If people are having their pension funds cut, why is the President and his family spending millions of taxpayer money for lavish vacations? Why is there plenty of money to fund billions in contractor overruns or millions of pages of new regulations and thousands of non-governmental organizations that increasingly interfere with our privacy and our lives? If funding is scarce, why are we tolerating hundreds of billions spent in violation of the Constitution and financial management laws? If you read through our Annual Wrap Up for 2016, the most important question for 2017 and the years ahead is can we turn the US federal budget and finances from a negative return on investment to a positive return? To say it another way, can we once again grow real productivity and stop the endless corruption and waste? The cultural and economic change required is extraordinary – but as I discussed with Jon Rappoport in Can We Make America Great Again – so is the opportunity. Much of the screams and drama you are hearing from Washington and the corporate media these days is the sound of members of the elite who are terrified of losing their privileges and lush gravy train and who are concerned about their own criminality being exposed. I want to step back, cut through that noise and look at “Who’s Who” in this transition through the lens of four profiles. Who’s Who in the Transition – the Four Profiles. Titanic Turners: The Titanic Turners are people who rise to the challenge. They understand that grabbing a first class cabin and the best chairs on the Titanic will do them no good if the ship sinks. They decide to exercise leadership and try turn the ship. They tend to see things whole and are focused on the mission. Titanic Turners think big. Piggies: Piggies start their day with one constant question, “What about ME?” They think small and selfish. 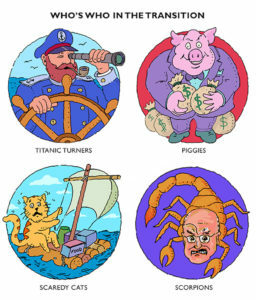 As government debt and corruption ballooned, Piggies have done much better than Titanic Tuners. Indeed, the more money they made, the more they were admired. For years, Titanic Turners have had to listen to why Piggies are smarter and better than they are. Indeed, there are plenty of very smart and resourceful Piggies – for themselves! Question is whether or not they can become Titantic Turners. They add a lot of top heavy, unnecessary overhead. Scaredy Cats know well how often the mob attacks without intelligence and discretion and how taking responsibility in the midst of corruption and danger is risky business. They want to make sure they get a lifeboat and are far away when and if the ship goes down. One of the things that turns people into Scaredy Cats is control files and related legal, financial and physical threats to themselves and their families. They feel they have no options other than to do what they are told irregardless of their legal, personal and fiduciary obligations. Scorpions are a serious problem. Remember the story of The Scorpion and the Frog? Scorpions lack empathy and lack the sensibilities of Piggies who often take some care not to kill the goose that lays the golden egg. Scorpions get their jollies from war, suffering, death and destruction. Their advantage is that most people can not fathom that a human being can be this devoid of empathy or common sense. But they can! There is no point trying to encourage Scorpions to support or become Titanic Turners. You just want to keep Scorpions away from the real power lines or else there will be serious trouble. Scorpions are the folks who are pushing hard behind the scenes for transhumanism and the infrastructure necessary for instituting physical slavery, including micro-chipping humans and implementing digital currencies. Calm the Scaredy Cats and set them to work doing things that are energizing for the Titanic Turners; if they are just too scared, help them get out of the way but stay financially invested in Titanic Turner success. Scorpions should be benched. Unfortunately they along with the Piggies have been using our prisons for the people they believe will not vote for them while the Scorpions and the Piggies run free and our national net worth disappears. Life is, of course, a bit more complex. The reality is that we can go through different phases. For example, as we are building a career or business, we tend to be more Piggy. As our “inner Piggy” matures, we may grow into a Titanic Turner. When institutions are in transition and traditional rules are not enforced, we have a failure of what financial people call “internal financial controls.” Those are the rules that would normally incentivize Titanic Turner behavior and protect Titanic Turners and Scaredy Cats from the manipulations of Piggies and Scorpions. This can be a dangerous time. That is why in every aspect of this transition, whether in the national government, in the statehouse, in the municipality and in our local community, we need to identify, cultivate and support the Titanic Turners. Ultimately the question is for all of us, for 2017, which profile am I going to be and who am I going to support? More than anything, the answers to these questions will decide our future.